I'm going to take a guess that the woman on left is what Lohan is going to look like in 30 years. I think that's Ingrid Sischy. 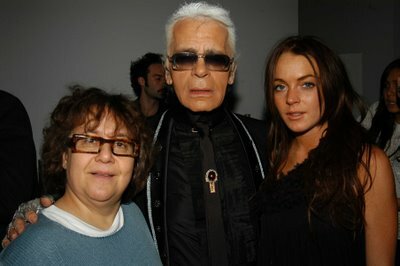 If La Lohan ends up anything like Sischy, then she should thank her lucky stars. Having a well-educated brilliant brain is considered desirable in some circles -- can you imagine? and the man in the middle is what she is going to look like in 50 years. No really.. with my expert designer help.. Lo-la will die young, thin and most beautiful..
30 years hell! She's looking a bit haggard in this photo.